Since the inception of living, related kidney donation, the better kidney has always remained with the donor (77). Historically, the percentage of right kidney donors in the open experience ranges from 26% to 37% (78). Common indications for right-sided donor nephrectomy include multiple left renal arteries or veins, right renal cysts, smaller right kidney, or possibly solitary right-sided nephrolithiasis (79-81). Right renal vein length is significantly shorter than left donor vein length. Laparoscopic use of the endovascular stapler or multiple clips also contributes to loss of vessel length of approximately 1 to 1.5 cm. The shorter length of the right renal vein may precipitate higher rates of graft thrombosis, because the technical issues of sewing a short renal vein into the recipient can be considerable. The early laparoscopic donor nephrectomy experience concentrated heavily on the left kidney. The reason for this preference included both the known longer left renal vein and the less complex operative exposure of the left renal artery compared to the right one. Also, the short right renal vein presented technical challenges for the recipient surgeon, and a high rate of recipient vein thrombosis following right-sided laparoscopic nephrectomy was concerning. A multicenter review of right-sided laparoscopic donor nephrectomy revealed a higher rate of graft thrombosis (79). As a result, in the initial experience of Johns Hopkins, the University of Maryland, the Washington Hospital Center, and the Seattle group, the left side was preferred in more than 95% of patients (16,18,75,82). Right renal vein length is significantly shorter than left donor vein length (75). Laparoscopic use of the endovascular stapler or multiple clips also contributes to loss of vessel length of approximately 1 to 1.5 cm (83). The shorter length of the right renal vein may precipitate higher rates of graft thrombosis, because the technical issues of sewing a short renal vein into the recipient can be considerable. Recipient surgeons have become more comfortable with implanting multiple vessel kidneys (10,21,28,80), and, given the choice, many prefer two arteries with a long left renal vein compared to a single artery and a short right renal vein. The confidence developed with increased laparoscopic experience and the ability to concentrate on obtaining greater vein length has allowed some programs to start using more right kidneys. The published results of 36 centers on 2691 standard laparo-scopic donor nephrectomies show only an 8.6% predilection for the right side, which is higher than the early reports of less than 5% (16,18,75,82). Technical modifications to maximize renal vein length and thus allow more standard right laparoscopic donations have been made. Mandal et al. at Johns Hopkins report three technical modifications that aid in successful right-sided laparoscopic donor nephrectomies (80). First, ports are placed in a configuration that allows the endovascular stapler to be fired parallel to the vena cava. 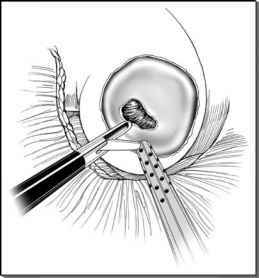 Second, a small subcostal incision is made at the conclusion of laparoscopic dissection of the right kidney to allow use of a standard Satinsky clamp. This hybrid laparoscopic/open technique allows a cuff of vena cava to be harvested with the right renal vein. Third, the recipient's saphenous vein can be used as a panel graft to lengthen the right renal vein. Buell et al. reported a multi-institutional review of right laparoscopic donors (79). After two early graft losses, Buell et al. modified their technique, including extensive vein mobilization, division of the vein parallel to the vena cava, and incorporation of a portion of the cava into the staple line by stretching the vein with the use of either a hand-assisted device or standard laparoscopic instruments. With these modifications, outcomes of right-sided laparoscopic donor nephrectomy became comparable to that of left donations. However, the major increase in right-sided donor nephrectomy performance has been due to hand-assisted laparoscopic technique, which affords not only an atraumatic lateral stretch on the kidney to maximize the vein length prior to firing an endovascu-lar stapler, but also superior control of the vena cava in the event of bleeding. Published results from 18 centers on 610 hand-assisted laparoscopic donor nephrectomies show a 40% preference for the right side. Despite the higher and slightly larger extraction site, the hand-assisted laparoscopic technique still offers a similar reduction in convalescence (84,85). The use of the retroperitoneal laparoscopic approach is somewhat more preferentially employed for right donations. Fewer centers use this approach due to lack of anatomic familiarity, but those centers that do report an 11.2% right-sided nephrectomy preference (Table 1). Turk et al. reported the use of a laparoscopic Satinsky clamp to maximize the length of the right renal vein (86). The clamp was applied to the vena cava at the ostium of the right renal vein, and the entire renal vein with a small cuff of vena cava was harvested. After kidney removal and pneumoperitoneum reestablishment, the cavotomy was closed with a running suture. This maneuver requires a reliable assistant to hold and stabilize the Satinsky clamp during removal of the kidney and closure of cavotomy with delicate laparoscopic suturing technique. Application of this technique is challenging and, therefore, not widely used.